Empress Dowager Ci Xi (Tz'u Hsi) was born during the winter of 1835. She was a Manchu whose maiden name was Yehonala. Little is known about her mother Huizheng other then she was working in Beijing at the time, and was a member of a political organization called the Eight Banners. At the age of 16, Hsien Feng became the 7th Ch'ing emperor. Soon afterward, Ci Xi was asked to auditioned for a position as a consort in Emperor Hsien Feng's concubine. Subsequently, from the original group of 60 participants, just Ci Xi and a few other girls were chosen to become consorts. At the time, Ci Xi was ranked 6th in the emperors concubine. Then just a short time later she was elevated to the 5th position. Before long, Ci Xi became the emperors favorite consort. So when she gave birth to Hsien Feng's only son she was elevated to the 4th position. One year later on her son's birthday she was again elevated to the 3rd position and called Noble Consort Yi. She was now ranked second to Empress Cian. Before long Ci Xi was assisting the emperor with day to day decisions. Then after a few years Emperor Hsien Feng died and Ci Xi's son Tun Chih became emperor. However, he was only 5 years old. As a result, the Empress Dowager and the emperors senior consort ruled as co-regents. 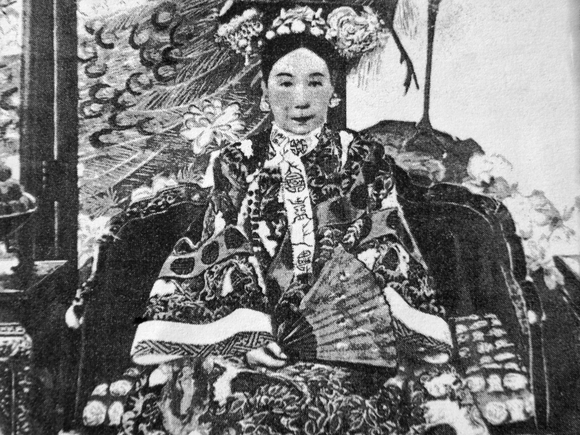 As time progressed, the Empress Dowager Ci Xi assumed more and more power until the marriage of her son in 1872. Unfortunately, her son would only live 3 more years. At this time, the Empress Dowager engineered it so that her nephew, Kunag Hsu, could assume the leadership of China. This was despite the fact that he was not qualified under Ch'ing Empire dynastic law. At the time, Ch'ing dynastic law forbade a new emperor from being from the same generation as the previous ruler. Ci Xi did this because she hated the next generations successor which was her daughter-in-law. Soon afterward, the pregnant daughter-in-law committed suicide. Under Ci Xi's leadership China was never very powerful militarily. During her reign Burma, Vietnam, and Korea all broke away from Chinese influence. Then in 1895, China was defeated in the Sino-Japanese War and forced to secede Taiwan to Japan. Ci Xi lost the war because she diverted enormous sums of money that was suppose to go towards the construction of a badly needed navy. Instead, she used the money to construct her new Summer Palace. Just three years later, China was forced to grant enormous land leases to Germany, Russia, Great Britain, and France. At this time, many believed that China was falling apart. As a result, the Empress Dowager Ci Xi instituted 100 Days of Reform which lasted from June 11 to September 20, 1898. At this time she barely survived an attempted coup. The Boxer Rebellion in 1900, resulted in the Empress Dowager declaring war against all the countries with which they had diplomatic ties. Many Chinese could not believe it when Ci Xi backed the Boxers because they were a secret organization that attacked Chinese Christians. As a result several thousand Chinese Christians were killed. The war ended with an international military force occupying Peking. As a condition of their surrender, China was prohibited from acquiring arms for 2 years and forced to repay 330 million dollars to the countries that were involved in the war. Then, on November 14, 1908, Emperor Kuang Hsu died, and on the following day the Empress Dowager Ci Xi died. It is believed by many historians that she had the emperor murdered in advance of her death. This was so that in the interval she could have her grand-nephew, P'u Yi, succeed Kuang Hsu as the last Ch'ing emperor. Overall, Ci Xi ruled for 37 years, and she left a vast fortune of gold and silver in the palace vaults which today would be worth billions.